Or rather 'mini-pavlova'. I made mini pavlovas because the visitor I was expecting, who does not eat wheat is also careful about how much dairy she eats, so I had planned to use Alpro vanilla dessert instead of the half fat creme fraiche that the rest of us would eat. In the end my visitor was not able to come, but I enjoyed thinking of dishes to meet her dietary requirements. Lay a sheet of baking paper onto a baking tray. You can draw out a 20cm circle for a large pavlova or smaller ones for the mini-pavlovas. Or if, like me, you can't be bothered with that, you can make them freestyle! Heat the oven to 160C. Whisk the egg whites until they are stiff. Then whisk in the sugar a teaspoon at at time until you have one teaspoon left. Blend the cornflour and vinegar together and add with the last spoonful of sugar. Spread or pipe the meringue to cover the circle or circles on the baking tray, building up the sides so they are higher than the centre. Turn the oven down to 150C, put the pavlovas into the oven and bake for 1 hour for the large one and about 45minutes for the small ones. Turn the oven off and leave the pavlova until it is cold. Lift off the paper and put on a serving plate. This is the first pick of rhubarb from the garden this year, I'm not quite sure how much weight. There were about half a dozen short stems, which I chopped to even lengths then put in a Pyrex roasting dish and covered with about 50g sugar. Roast the rhubarb in the oven at about 160C for 15-20 minutes until the sugar had melted and the rhubarb is soft but hasn't broken up. Put about 100g of whipped cream or creme fraiche into a bowl. 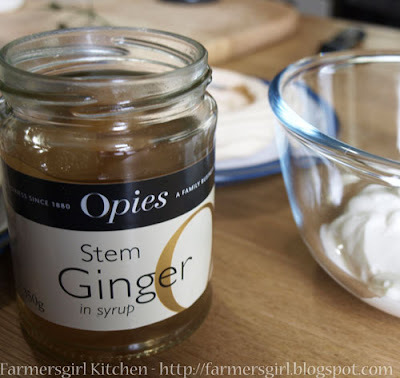 Chop two pieces of stem ginger and stir into the cream, then add about half of the rhubarb and mix through. Fill the pavlova (s) with the cream mixture and top with the remaining pieces of rhubarb and drizzle with the lovely pink rhubarb juice. 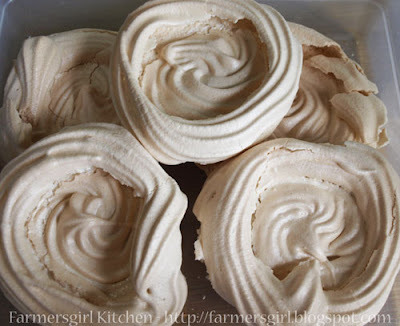 If you don't have time to make the meringues then this is a quick, easy and impressive dessert to make with bought meringue nests. Beautiful! I can taste these now. 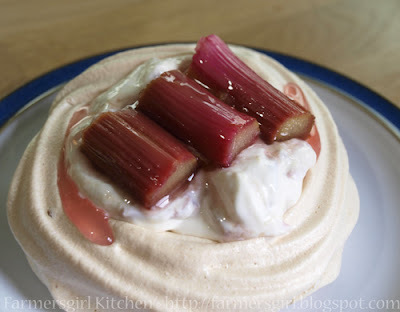 And a brilliant combo because the tartness of the rhubarb must work so well with the sugary meringue Nice! I just said "Oh My Goodness!" really loudly when I saw that first photo. 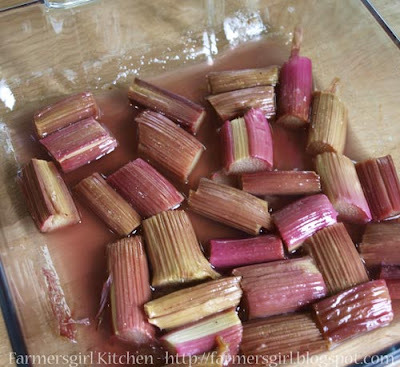 You have no idea how much I love rhubarb and how desperate and I mean desperate I am to have these!!!!! Great flavour combo Janice. Perfect for an Easter treat. I like the colour your rhubarb went but is it because it's homegrown or because you roasted it? My rhubarb is only just coming through now. I love your freestyle meringues! Absolutely STUNNING Janice! I LOVE rhubarb and meringues, so FAB!